Toronto and Region Conservation Authority (TRCA) in partnership with the Town of Caledon has completed the Humber Station Road Schedule B Municipal Class Environmental Assessment (EA). The study was undertaken to facilitate remedial erosion control works along a section of the Humber River where slope stability and erosion are creating a risk to public health and safety. The Toronto and Region Conservation Authority (TRCA) and the Town of Caledon have completed a Municipal Class Environmental Assessment for the Humber Station Road Project. 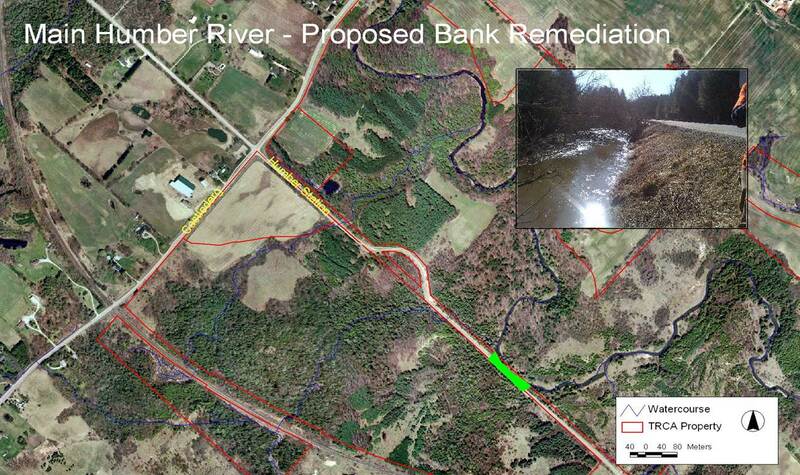 The Humber Station Road study was undertaken in accordance with the Municipal Class Environmental Assessment for Remedial Flood and Erosion Control Projects and was documented in an Environmental Screening Report (link below). 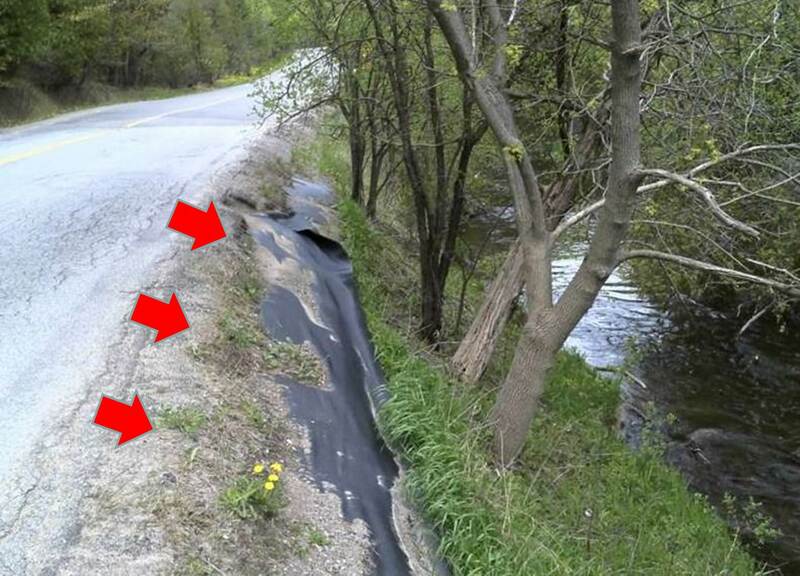 In 2012, TRCA Restoration Services staff reported concerns of slope erosion and instability along a localized section of the Humber River adjacent to Humber Station Road in the Town of Caledon. Subsequent site inspections identified continued deterioration. The erosion is introducing a greater amount of fine sediment and road run-off to the watercourse than would be found in a properly functioning system. TRCA also noted increasing damage to the road surface and exposed geotextiles, potentially endangering road infrastructure and motorists. In January 2013, TRCA retained the professional engineering firm WalterFedy to complete a geomorphic and slope stability assessment. The objective of the assessment was to determine the cause(s) and effect(s) of the riverbank erosion and slope instability based on acquired geotechnical and topographical data. Specifically, the associated hazards in terms of the risk to existing infrastructure and public health and safety were assessed. The purpose of the Humber Station Road project is to reduce the risk to public safety and infrastructure by providing long-term and low maintenance protection against erosion and slope stability that is compatible with the surrounding physical, biological, social, and cultural environment. This project is subject to approval under the Environmental Assessment Act. TRCA has completed a Municipal Class Environmental Assessment (Class EA) to identify a remedial solution for the Humber Station Road project. The study proposal received approval to proceed at Authority Meeting #7/12 held on September 28, 2012 and a Notice of Intent was published in the May 30, 2013 edition of the Caledon Citizen to inform the public that a Class EA has commenced for the design and implementation of remedial works for the Humber Station Road project. In addition to the Class EA process, TRCA recognizes that the Humber Station Road project will require an environmental screening and approval process under both the Fisheries Act and Navigable Waters Protection Act. The solution to stablize the valley slope, which is adjacent to a municipal road and where the watercourse is flowing against the toe-of-slope took into consideration 3 techniques: slope treatment, toe protection, and channel re-alignment. Slope treatment involves placing engineered fill on the slope. Toe protection involves placement of material at the toe of the slope that will resist the erosive forces of the river. Adjusting the horizontal alignment of the creek will move the erosive forces of the river away from the toe of the slope and prevent further deterioration. All of the alternatives have incorporated a 5m offset from the existing edge of pavement of Humber Station Road; 1m for guard rail, 3m for multi-use trail, and 1m for a vegetated buffer between the trail and the new top-of-slope. Accordingly, there are six (6) possible alternatives. The construction of Alternative 6 would require extensive cutting into the valley slope west of the existing road alignment resulting in considerable impact to the physical and biological environments. This alternative was not advanced for further evaluation. An evaluation of the six (6) Alternative Solutions was conducted using five (5) criteria determined to be applicable to the problem: Existing Aquatic Habitat, Existing Vegetation, Existing Structures, Capital Cost, and Maintenance Needs. Alternative #5 has been selected as the Preferred Alternative to advance through detailed design and implementation considering: i) construction activities will be less intrusive to aquatic habitat than other options; ii) the least amount of grading will be required on the embankment slope relative to other options; and iii) there will be the least impact to vegetation communities upstream and downstream of the immediate construction area relative to other options. Implementation of Alternative #5 involves rebuilding the road in its current location, and installing a retaining wall between the river and roadway. This will provide the opportunity to stablize the roadway and embankment with less grading than other options, and without the requirement to realign the river. Further stablility of the river bank and retaining wall will be facilitated through installation of appropriately designed toe protection and bio-engineering (where suitable). The Class EA process ensures that all views respecting a proposed remedial flood or erosion control project be taken into consideration during the planning and design of remedial flood and erosion projects. As part of the Class EA process, a project stakeholder list was developed and is comprised of aboriginal communities, local community organizations, government agencies and interested stakeholders. Stakeholders were informed about the project through notices, project updates, and consultation meetings. Interested groups, agencies, and stakeholders have provided feedback on the evaluation of alternative options in order to determine the preferred remedial measure and to address any concerns regarding the proposed works.